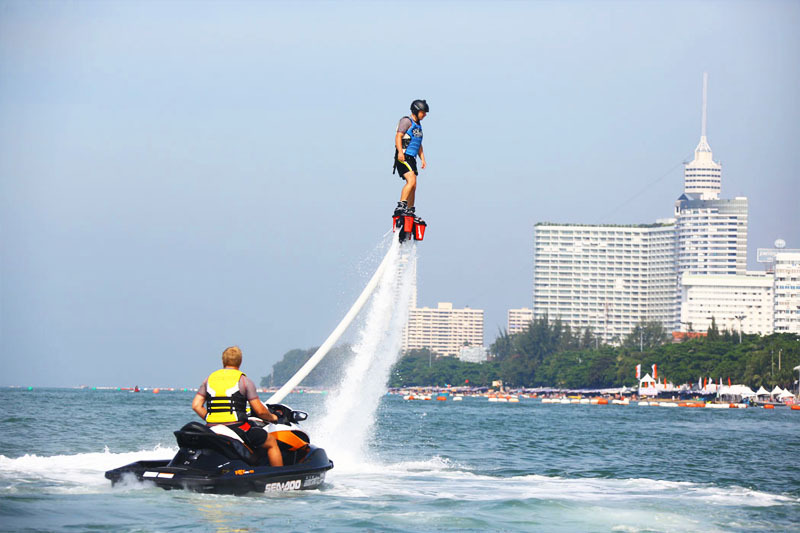 Flyboard in Pattaya - rental, prices, reviews, contacts. Dip into the world of extreme sports: experience unforgettable emotions, flying like a bird and diving like a dolphin. 90% of people start to fly on the first try. Experience the complete freedom of flight like a bird. Full equipment, jackets, experienced instructors. In 2012, the world saw the first real, amazing flight on the feet, like "Iron Man". 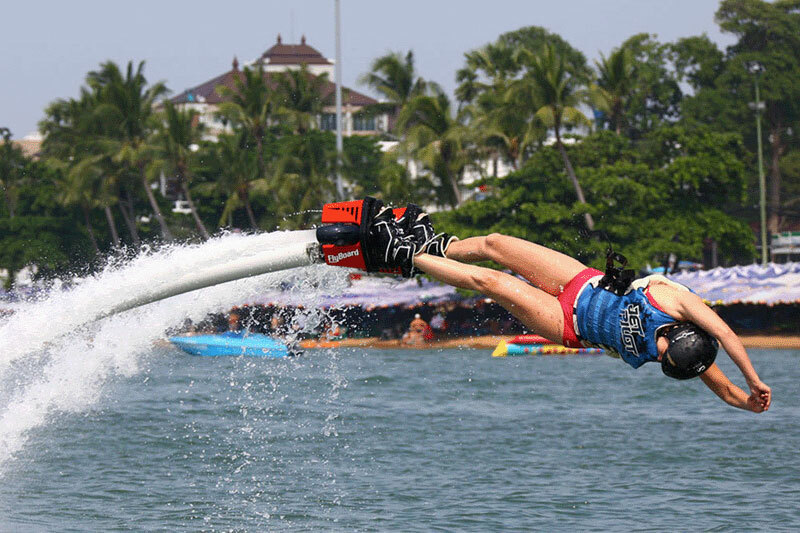 It was possible with ingenious invention called Flyboard, by Franky Zapata, world champion in aqua-bikes. 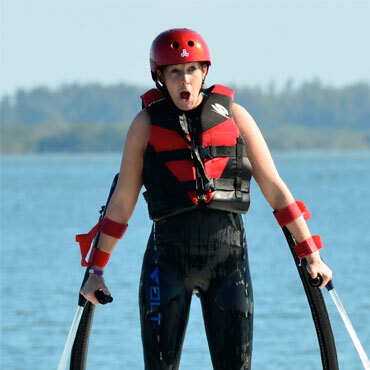 The construction represents shoes, mounted on a special board and connected to the personal watercraft with a hose. All this creates two powerful stream of water directly under your feet. It's allows you to fly up to 15 meters height over the water, do many beautiful kinds of tricks, dive like a dolphin and etc. We are glad to offer you to experience the flyboard, this incredible construction of Franky Zapata, with our team in Pattaya. We love and do Flyboard from the day of his birth. Welcome to the world of extreme sports. We will pick you up at the appointed time and take you to our lake, after the flight will drive back. Before flying you will get detailed information with your instructor how to safely control your Flyboard. 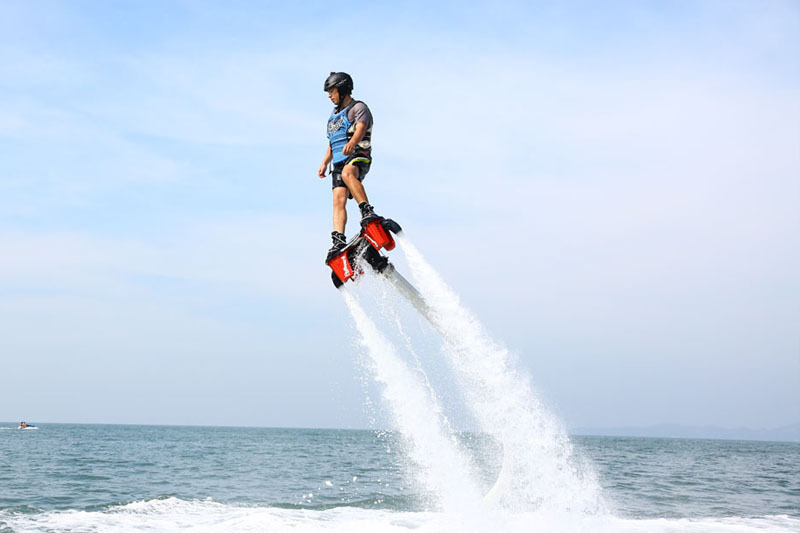 Within 20 minutes you will fly on flyboard, and will get incredible experience and the feeling of freedom.